Use footnotes and endnotes to explain, comment on, or provide references to something in a document. 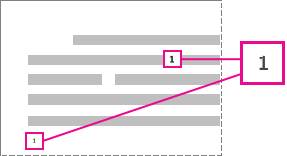 Usually, footnotes appear at the bottom of the page, while endnotes come at the end of the document or section. If you’re in Reading View, switch to Editing View by clicking Edit Document > Edit in Word Online. Click Insert > Insert Footnote. Click where you want to add the endnote. Click Insert > Insert Endnote. Click the reference number or mark in the body of the text or click Insert > Show Footnotes(for endnotes, click Insert > Show Endnotes). In the footnote/endnote view, click Format Footnotes or Format Endnotes to display the Format Options dialog, where you can change the size, font, and indentation of one or all of your footnotes or endnotes. Note: If you want to convert footnotes to endnotes or the other way around, use the Open in Word command and convert them there. 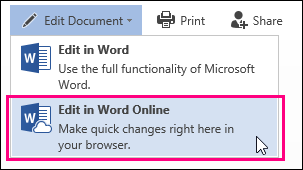 When you save the doc in Word, it's saved where you opened it in Word Online.